I hope everyone has had a great Christmas. Following the visit of Santa to Elland Road on Saturday, our kids got the surprise of their lives when he turned up on Sunday at our Christmas Eve celebrations on the way to deliver all his presents. Knowing Santa is a Leeds fan and the fact that he was at Elland Road the day before meant he got a fantastic reception! 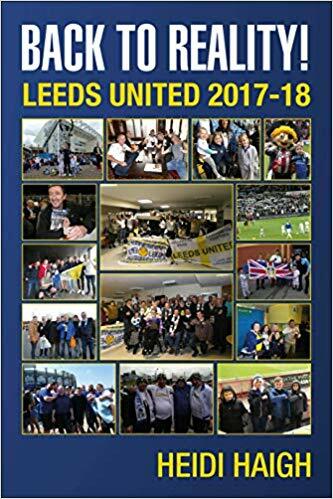 When I got my present of a stone in Bremner Square titled Heidi Haigh, Follow Me and Leeds United from my family, all I could do was cry as that was exactly what I would have put. I’d come home from an away game and said I was going to get one only to be told an emphatic NO! I guessed I was getting one but the emotion I felt when I opened my present was captured on video when I burst into tears. There will always be a part of me at Elland Road once I’ve long gone. After the weather being so mild yesterday I was surprised to find ice on my windscreen from sleet when I set off which was a complete contrast. It did try to snow on the way to Elland though but luckily it was too wet for anything bad on the roads. Seeing a sign saying the A58 was closed at Wyke and I needed to do a detour was all I needed. I knew there had been a burst water main last week but the road had still been in use on Saturday. I thought I’d keep going until the road was totally blocked as did other cars and lo behold, it was open all the way to the motorway! As I got to Leeds I felt as weak as a kitten once again but have decided it’s down to dehydration. We had a relatively short journey as we were stopping in Chesterfield today but that didn’t stop me falling asleep three times only waking up to do the football card, golden goal and pay for my coach fare. Whilst stood at the bar I did nothing but yawn despite the sleeping but after a pint of coke, a pint of water and three lattes (free after the first one so why not?) I should be able to keep awake during the game lol! When we got back on to the coach I found out I’d won £20 on the football card. Having said I never win but did it anyway, I’ve had to eat my words so thank you Preston. We got to the ground in good time and got dropped off right outside it. I went past the standing part for the away fans and heard my name shouted. Even though I’d seen Kev at the last two games, I’d forgotten to pick my membership cards up from him so today it was third time lucky. As I got in the stand I went and hung my flag up in the corner of the seating area in readiness for the start of the game. I spent time taking photos and was able to go near to the dugouts and the tunnel. A couple of women next to me were waiting to take a video of the match ball sponsors and I said if there were any photos I’d taken that they wanted to save they could do. To remember my name I was added to the end of their video too. The game had kicked off as I headed to my seat and the ball was kicked into touch just above me but I still ducked. I also had to sign my book that Phil Thumbs Up Cresswell had bought and thank you for the support. He had some good natured banter thrown at him from some of our fans which was funny. The team today was Wiedwald, Ayling, Berardi, Cooper, Jansson, Alioski, O’Kane, Hernandez, Roofe, Cibicki and Vieira. Subs were Lassoga for Cibicki (75), Phillips for Vieira (77) and Pennington for Alioski (90). Attendance was 5,612 With 1,730 Leeds fans. Leeds won the game 2-1 with goals from Hernandez (free kick 61) and Roofe (64). Leeds started on the attack towards the Leeds fans (opposite to last season) and were playing some good stuff down the wings with both Cibicki and Alioski involved in a lot of the play. We had some chances too but they weren’t on target although we had a lot of possession. Roofe was guilty of missing a couple of good chances but was getting closer when his shot went past the outside of the post. It just shows how you need to take your chances because all of a sudden we were a goal down against the run of play. The ball was hit from the right side of the goal and there was one of the Burton players on the left on hand to poke the ball over the line. That was gutting and there was a de ja vue feeling amongst the fans. Burton hadn’t won at home in seven games and with it being a small ground that has a non-league feel about it, was it going to be a banana skin? It nearly was after we’d had a free kick and immediately Burton went on the attack as they won the ball near our penalty area for what looked like a breakaway goal. Lucky for us the final shot was wide as it looked odds on that they would score. The whistle went for half time with a bit of a free for all going on at the far left hand side of the pitch. Although Jansson was going berserk it looked like it was something to do with Berardi but as I’d taken my glasses off I couldn’t make out what had happened. The linesman down our side was constantly getting offside wrong with the men in front of me saying he wasn’t fit enough to keep up with play. The second half still saw us with a lot of possession. Vieira had a really bad tackle made on him and he was down for a while so it was good to see him get back up and carry on. We started getting into the game and won a free kick on the edge of the penalty area. As the fans chanted for Hernandez to take it, I was interested to see what would happen as the recent addition of our free kick or corner specialist (I can’t remember which) could make a difference. It was funny seeing the reaction of the Burton goalkeeper who was going nuts behind our players who stood in front of him. He couldn’t get a clear look at the wall in front of him and the next thing the ref went over and booked him. As soon as we went to take the kick our two players ran back on side as Hernandez sent a fantastic shot just inside the post to equalise. What a cracker of a goal that was! Three minutes later Roofe ran onto a through ball and this time finished it properly by putting it into the net to put us into the lead, sending the Leeds following wild! What a turn round that was but also a relief to be in front. I don’t think anything untoward happened, but all of a sudden I saw the stewards taking someone out to the left of me and realised it was Aaron Cawley. For the rest of the game we were fine when on the attack but then decided to play about with the ball across the back line thus inviting Burton to attack and put pressure on us. Our best form of defence is attack Leeds and don’t forget that! Although we had some more chances it was Burton who ended up on the attack when six minutes of injury time was put up. With one attack it was battle stations in our penalty area and it was good to see us overcome this attack to keep the ball out and get the win plus another three points! It has been a good Christmas period so far and keeps us up near the top of the table in the top six. There were plenty of happy smiling faces at the end of the game because of the win which was good to see. Also although I hadn’t realised it, this was the first time in over a year that we had come from behind to win a game. Our coach driver also broke his hoodoo as it is the first time we’ve won with him driving as far as I’m aware. Saturday sees our second away game in a week with our visit to Birmingham before starting the New Year with a home game against Nottingham Forest. The latter is also on Sky with a 3pm kick off. I would love that to become the norm; being on Sky but with a 3pm kick off even on a Saturday! LUTV also were streaming the game live to 33 different countries such is the pull of our fantastic worldwide fan base! See you on Saturday – LUFC – Marching on Together!